A very popular, and simple approach is to simply keep track how many purchases a customer makes, and enable them to have their next purchase at a reduced or zero cost. This works well for businesses that have just a few types of product or service, such as a Coffee Shop, a Pub or a Personal Trainer. Indeed, such businesses may already be running such a scheme using paper-based cards that they stamp each time a purchase is made. This is approach is simple for the customer to understand and see how many more purchases they need to get their next reward. In GAINLOYALTY you can set your loyalty scheme to the "Discrete offers" mode and create one or more offers of this type. 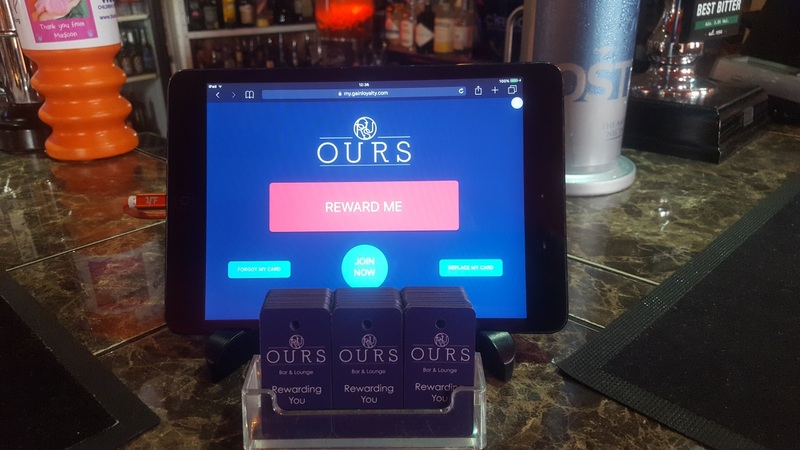 The second main approach to consider is to award customers points when they shop (for example, 1 point per £ spent) and make available a choice of rewards which may have different points values. This approach offers some benefits in terms of flexibility. For example, you may want to award points to a customer as a thank you for introducing a new client. You can also run promotions such as a "points boost" where you might award double points during quiet periods. For businesses with a variety of products or services, then a points-based loyalty scheme is probably the right approach. A third approach is to free your staff from awarding points, and invite the customers to "check-in" instead. They can be awarded a fixed number of points each time they visit, or spend more than a certain minumum amount. 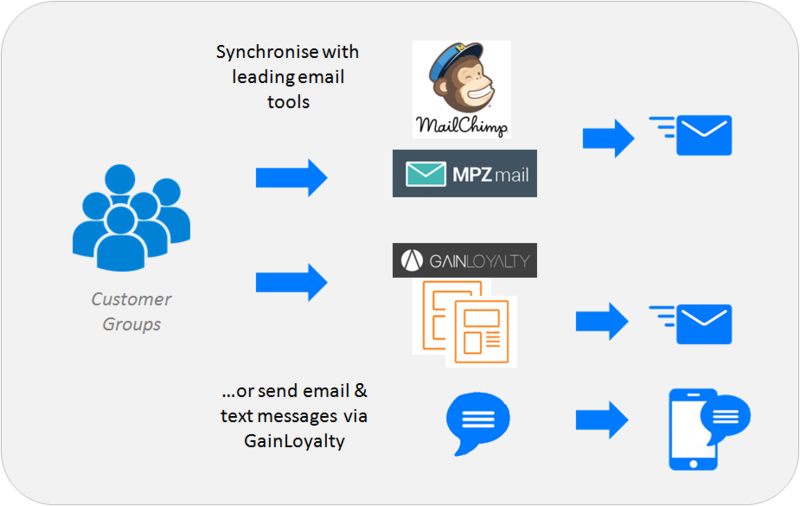 This approach becomes practically self-administering, yet you still beneift from all of the profiling and contact features that GAINLoyalty provides. 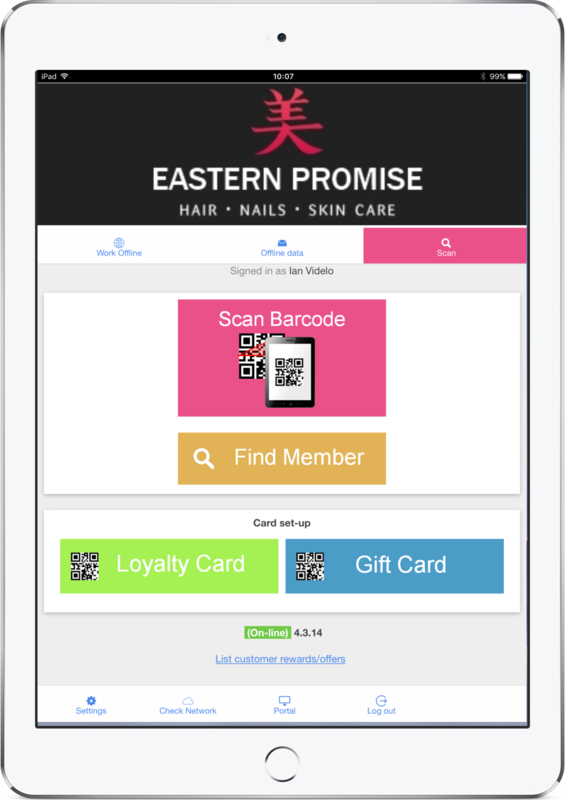 You can run your loyalty scheme from an Android or iOS smartphone or tablet. Log in to your business's Gain Loyalty account via our Gain Loyalty app. Configure your loyalty scheme and communicate with your customers via our secure management portal. For those customers who prefer a physical card, then we can produce your own branded loyalty cards to your design. Push your customer database directly into popular email marketing tools such as MailChimp or MPZ Mail and send out powerful email messages to everyone, or just a particular set of your customers. Set up special messages to be sent out automatically just before a member's birthday, when they reach a given number of points, or even when they haven't been seen for a while. GAINLOYALTY provides everything you need to operate your own loyalty programme – an essential tool for fostering custom that returns again and again, tailored completely to you, your business and the ways in which you work. No extra hardware, no need for expensive security solutions – Simply a system that’s powered by the cloud, leaving you ready to go. Design your own branded cards – Your brand colours, logo and style. Customers can use our My Reward Card app – Easily save their loyalty card on their phone. iOS and Android compatible – For management from wherever you are – by desktop, tablet or smartphone. 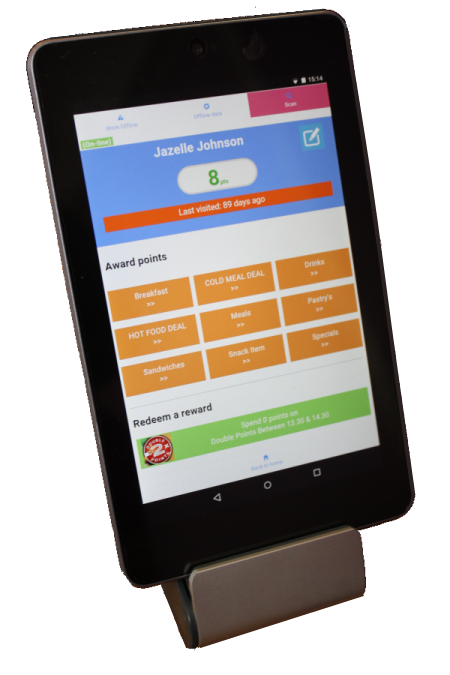 Tablet and smartphone scanning – For mobile loyalty and scanning wherever your employees and customers are on the shop floor. Integration with NFC capable devices – Our loyalty cards can feature an in-built NFC chip or a unique barcode for scanning with camera or barcode scanner. 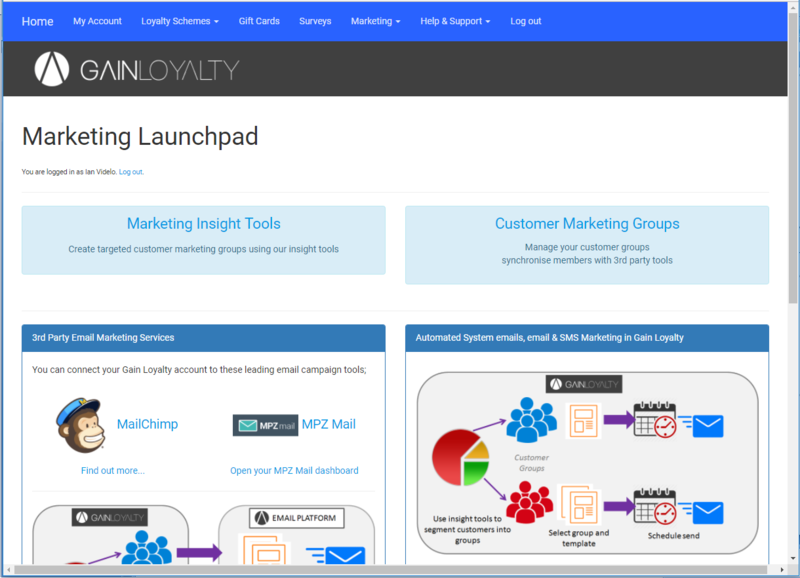 GAINLOYALTY is incredibly versatile and can be tailored around you and how and when you wish to award loyalty points. 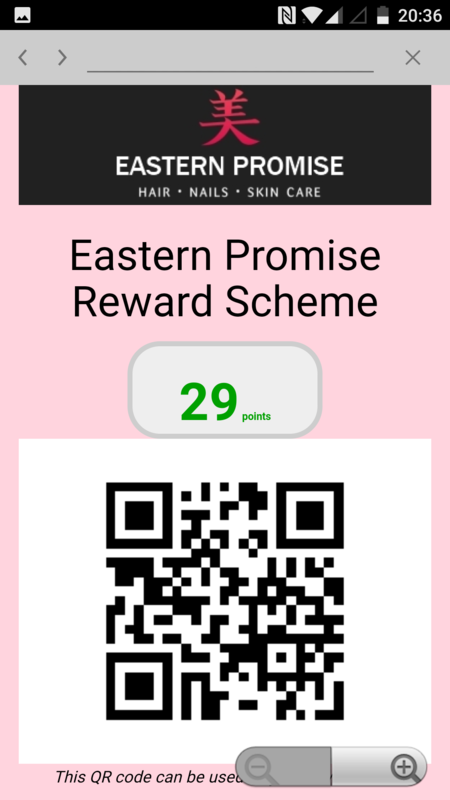 You can choose how many points to award, which products or services to award them for and set points levels to achieve any given reward. All of which is managed through an easy-to-use management portal – allowing you to change elements for your scheme as and when you wish. Your portal very much serves as a window into customer behaviour – ideal for supporting your marketing efforts with data that details when your customers visit, what they buy, how much they spend and how new a customer they are. Points-boost: Boost footfall during quieter times with higher loyalty points value (choose certain days, time of the day or periods in the year). Anniversary Offers: Make your customers feel special – celebrate their anniversary or birthday with automatically emailed vouchers. Customer Self-registration: Save your employees’ time by allowing your customers to register their own cards. Customer Self-care: Empower your customers in making the most of your scheme with management directly from their smartphone app – through which they can check their balance, view previous transactions and sign into your website. Get creative with original points presentation: Go beyond generic numbers and choose your own graphical representation of points. 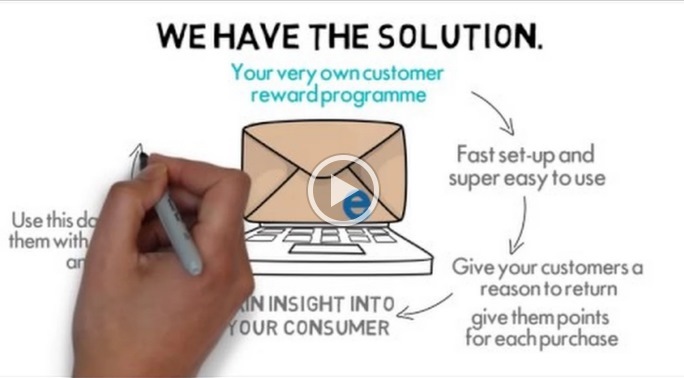 Send Marketing Messages: Supercharge your marketing with our powerful analytics tool – create customer groupings based on behaviour (such as customers who tend to buy a particular product) and send them relevant offers and messages by email. Custom-design (optional extra): Loyalty cards with your own branding with a turnaround time of as little as 3 to 4 weeks. Capitalise upon your customers' love of your brand. 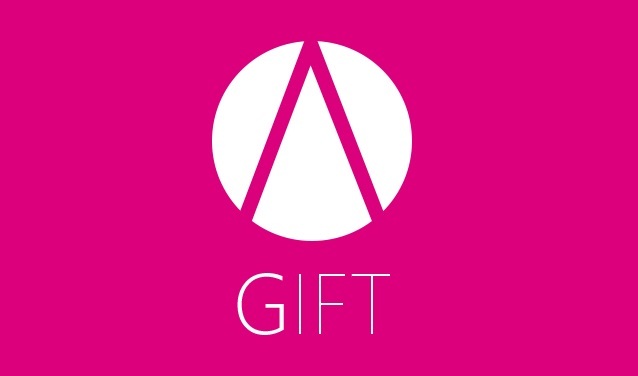 Our gift card scheme comes at no extra cost at all (included in our Lite package and upwards). We make is a breeze to sell gift cards on line, as well as over the counter. 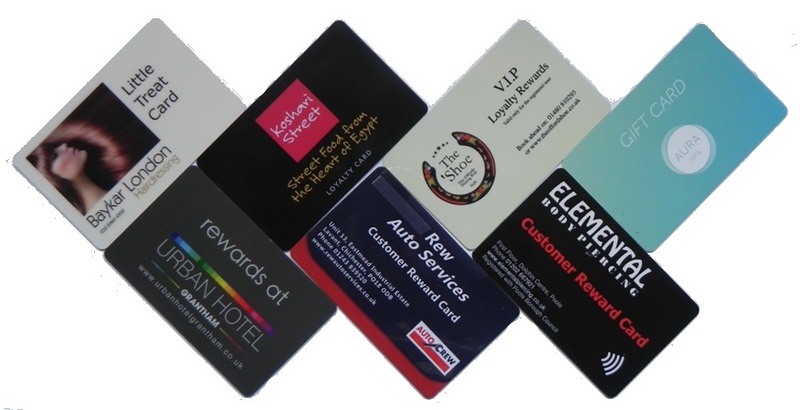 Do you want to have loyalty cards designed to reflect your own branding? We can arrange to produce these for you, and have them ready in 3 to 4 weeks. These are available in both NFC and QR code versions, and are an ideal way for you to try the service before deciding to invest in designing your own cards. 100 Cards: £70 (including shipping to a UK address. Contact us for overseas delivery). Choice of colour: Charcoal cards are available in both NFC and QR code versions. Red is available in NFC only. With certain Android devices, it is possible to use NFC (the same technology used in contactless payment cards) to simply tap a card. Not only does this make it simple to recognise a card, but it also frees up both sides of the loyalty card for your brand and any messages you want to include without having to leave space for a barcode. Unfortunately, iOS device do not allow 3rd-party applications such as GAINLOYALTY to use their NFC readers. When it comes to the time to order your loyalty cards we will walk you through the releative benefits of using barcodes vs. NFC based cards to arrive at the right solution for you. 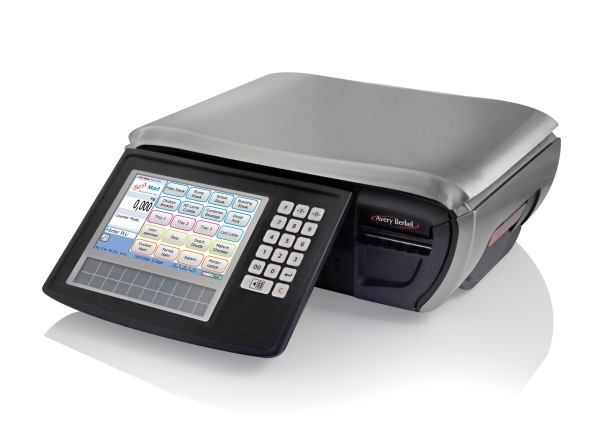 For many clients, the tablet's built-in camera in more than adequate for scanning loyalty card barcodes, but in some cases where speed is critical, then a separate barcode scanner may be worth considering. 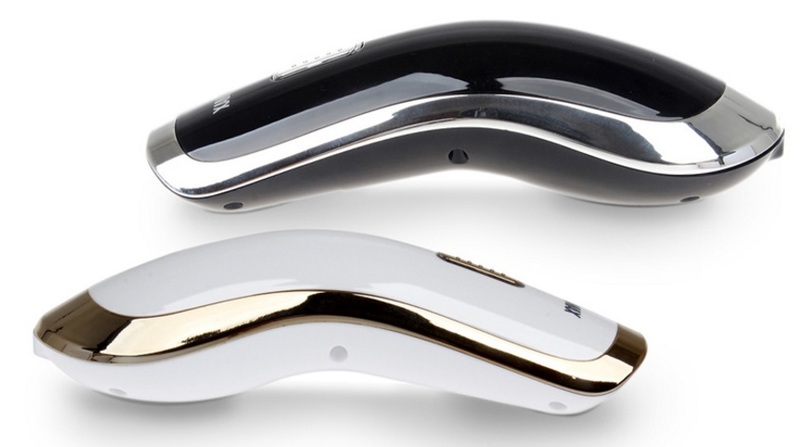 For most Android devices, it is possible to connect a Bluetooth ™ barcode scanner which helps to streamline the process of scanning a loyalty card in a busy environment. The same approach is possible with an iOS device, although you will need an iOS certified barcode scanner in order to retain access to the devices own on-screen keyboard within the GAINLOYALTY app. Gain Loyalty provides three quick ways for customers to keep their loyalty card on their phone. 1. 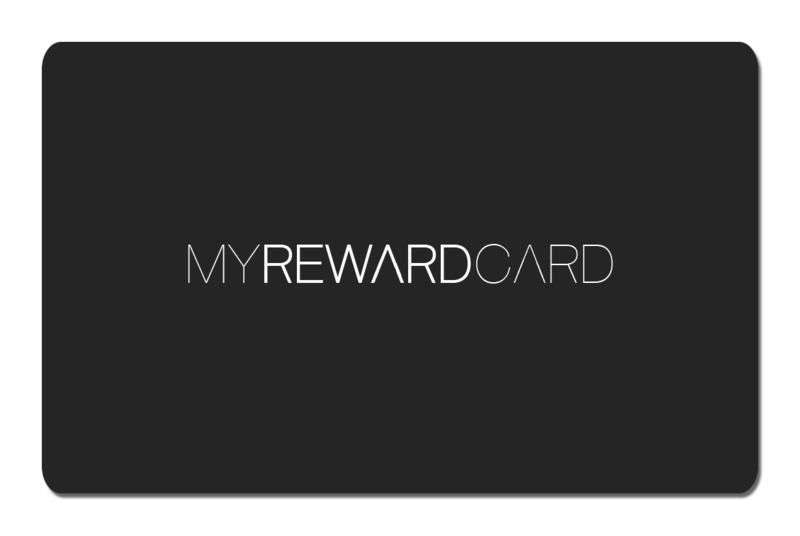 Firstly, a user can simply use our "My Reward Card" app. 3. Another popular option is to save the card as a "web app" or bookmark icon on the user's phone, so they can open their card at the tap of an icon. 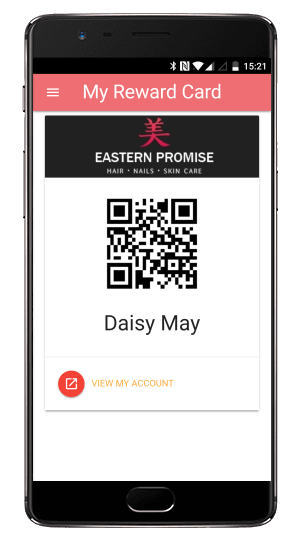 With Passbook on iPhone, and compatible apps on other mobile platforms, customers can already keep their loyalty card on their smartphone. Now we are seeing the start of the mainstream adoption of smart-watches such as iWatch. 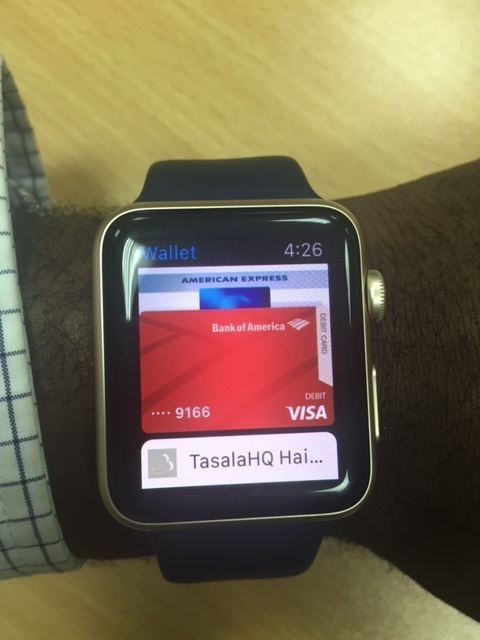 For owners of Apple's iWatch, Gain Loyalty can export a loyalty card in Passbook format which can then be uploaded to the watch. By making each end customer’s loyalty card downloadable as a QR code image, it will be simple to store it on ay other make of smart watch. 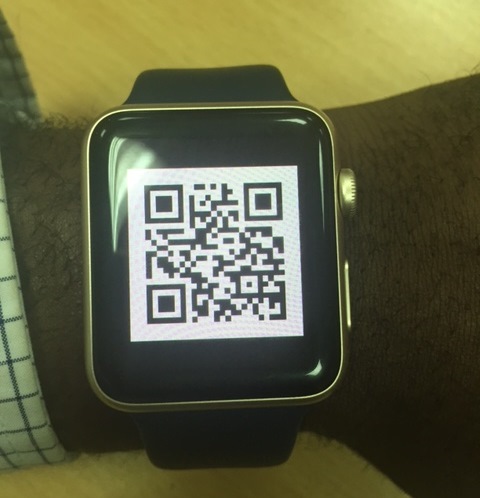 Pebble users can use a watchface generator to attach an image in the face, whilst for Android Wear users, gaining quick access to a QR Code is really simple. The Google Keep app allows you to save images that sync instantly across all of your devices, so all you need to do is save your code to Keep, open Keep on your phone, and you’re good to go.